As a writer, few things are more important to me than the tools of my craft. I’m a bit of a perfectionist, so I need my tools to work to their fullest potential if I’m going to be happy and productive. A pen that has trouble writing, for instance, will inevitably send me on an epic quest to find a superior implement. I’ve settled into a comfortable system over the years, combining the best of both physical and digital writing, but every so often I’ll happen upon another chink that needs fixing. Lately, the issue has been my laptop. Between the three years of heavy usage and an ill-advised “upgrade” to Windows 8, my laptop has been encumbered with a myriad of problems that made any usage less than pleasurable. For example, the machine ran ridiculously hot. So hot, in fact, that it frequently made my bedroom feel like a sauna in almost no time, and trying to run any game more complex than Minesweeper or Solitaire would immediately cause the computer to overheat and shutdown. Another problem, albeit more personal, is that I was tired of carrying a large, heavy laptop when I want to work away from home. My old netbook – you may recall – served me well as a highly-portable writing machine, but sadly that computer has also seen much better days. After dealing with these issues and more for over a year, I decided that I not only needed a new laptop soon but that perhaps I should invest in one more finely tuned to my actual usage habits. What I finally settled on was a Google Chromebook. It was the most rational choice considering that 95% or more of my computer usage took place inside Google’s Chrome browser already. Besides being heavily invested in Google’s ecosystem – especially services like Gmail, Drive, and Hangouts – I use a variety of web services to accomplish tasks across devices. I discover and listen to new music using Spotify, Pandora, and Soundcloud. I move copious amounts of text around in Evernote. I’ve been managing my finances with a Google Spreadsheet for years. All of my photos and other files are backed-up to Google Drive, and I’ve long since uploaded my mp3 collection to Google Music. The list goes on and on. I know Chrome OS is just a glorified web browser posing as an operating system, and that comes with some obvious limitations; honestly though, that’s hardly even an issue these days. It also makes for a great replacement for the netbooks of yesteryear. A lot of people – especially on the tech blogs – really derided netbooks as a whole: according to them, netbooks were tiny laptops with under-powered hardware and frequently cramped keyboards that weren’t really good for “real” work and wouldn’t you rather have an iPad? But those descriptions really undermined their utility for writers and especially students. For a few hundred dollars, I was able to buy a bonafide computer that was not only small and light enough to toss in a book bag without weighing me down, but had a battery that could last for an entire afternoon at a coffee shop. Chromebooks fill that niche exceptionally well. Of course I put a Triforce sticker on my Chromebook! I realize that – as someone who primarily writes – I’m the perfect candidate for a Chromebook. Combined with something like Evernote (which I’ve already evangelized), it’s a fantastic writing tool. With almost no effort, I can create a completely focused writing environment and get going with my craft. If I have any complaints, it’s with the keyboard. The smaller size of this Chromebook means that the keyboard is rather minimal and certain keys – namely “Delete”, “Home”, and “End” – are not represented. I don’t know about you, but I frequently use those keys when writing; their absence is sorely felt on a daily basis. 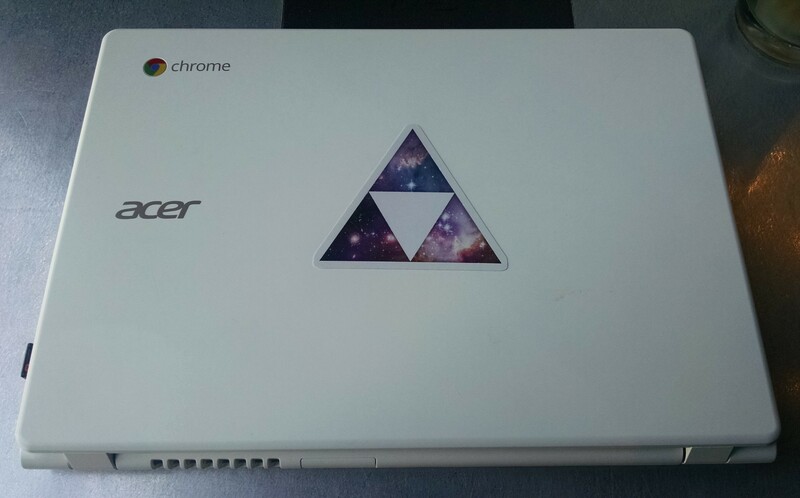 Overall, I’ve been very satisfied with my new Acer Chromebook. It’s the best computer for writing I’ve ever used, and though I’ve only had it for a couple months, I’m already looking forward to using it for many more to come.